What are these mysterious objects? And what is their unknown purpose? Archeologists have discovered hundreds of eerily similar clay objects in archaeological sites in Egypt, Syria and Iran from the 12th and 13th centuries. 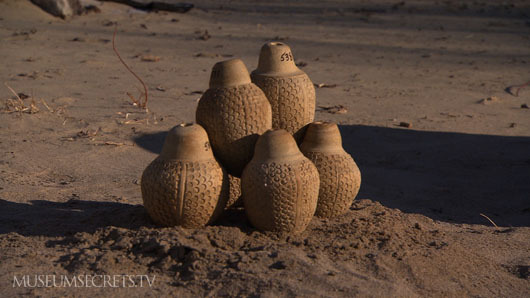 Those who trade in antiquities refer to them simply as the "Mystery Vessels." They are not mysterious because they are rare, or because of how they are made. But try as they might, experts at the world's greatest museums have been unable to answer this simple question: What are they for? These diminutive whatsits conceal a secret that will surprise you: an 800-year-old technology that is amazingly similar to our own. All will revealed in Museum Secrets: Inside The Royal Ontario Museum. Read on for HINTS and THEORIES. Or… scroll down for the SPOILER. Their surfaces are marked with small circles or diamond shapes. They fit nicely in the hand but are too heavy to hold for long. They are dense enough to hold a liquid without leaking. They have a hole in the top but the holes are too small to drink from. They have been found both whole and shattered. For a spoiler watch our Web Exclusive Video: Mystery to Theory. As Curator Rob Mason explains, the best clue can be found in the decorations that adorn the vessels. The decorations vary but have one consistent feature: the surface is broken into small areas by striations. To the trained eye this is reminiscent of the striations on the surface of a hand grenade. Hand grenade striations ensure that the force of the explosion will break the grenade into many pieces, creating a shock wave out in all directions, with the pieces becoming shrapnel. Do the markings on the Islamic Vessels serve the same purpose? The only way to find out is through experiment. We did just that experiment for Museum Secrets. The result? Find out by watching explosive action footage of our hands-on experiment in this Web Exclusive Video: Explosive Experiment. 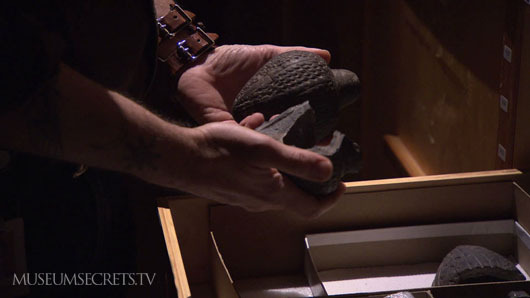 How hard can it be to discern the purpose of an ancient object (like a Mystery Vessel)? To demonstrate, we've taken a familiar modern object and subjected it to 900 years of virtual wear and tear. See if you can figure out (or guess) what it is by viewing our Interactive Feature: 900 Years Later. 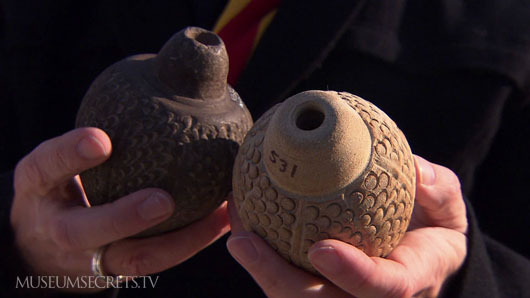 If the warriors of the Islamic world created hand grenades… did they come up with other military innovations? Check out a list here on Wikipedia. We believe we have proven our case that the Mystery Vessels are ancient hand grenades, but some other authorities would doubtless beg to differ, notably the French authority on all things Islamic: Jean Sauvaget. You can find out about Sauvaget and his views (in French) on Wikipedia. Is the firing of the clay uniform? if it is slightly under fired more towards the opening I would guess they were ornamental and made to fit on top of some kind of rod with this in situ during the process. @ #3: Good question -- I\'ll pass it on to Rob (the curator you see in the episode) and get back to you with an answer! 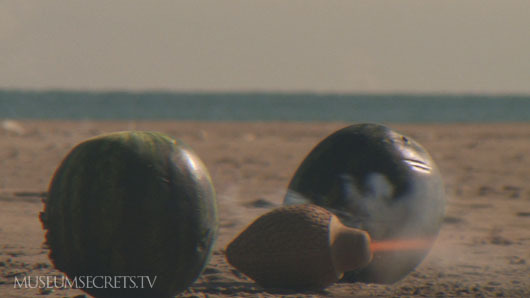 I agree that the mystery vessels are likely early hand grenades. Some years ago, I arranged for the donation of the \"Barry Gillis Grenade Collection\" to the Canadian War Museum. There are over 500 inert grenades, some dating back hundreds of years. @ #3: The vessels are evenly, and very well fired, to stoneware temperatures. The strength of the opening seems more indicative of a significant desire to contain the contents!